The Sales Bible softbound NEW EDITION WITH SOCIAL MEDIA ANSWERS Global sales authority Jeffrey Gitomer's bestselling classic, The Sales Bible, has been updated and appended in this new edition, offering you the ultimate sales methods and strategies that really work every day, in real-world selling situations. With over 200,000 copies of the previous editions sold, The Sales Bible was listed as one of "The Ten Books Every Salesperson Should Own and Read" by the Dale Carnegie Sales Advantage Program. 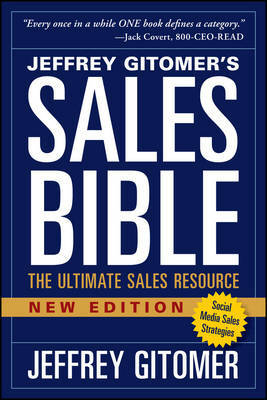 Jeffrey Gitomer's column, "Sales Moves," and blog, "SalesBlog.com" are read by more than four million people every week. His customers include Coca-Cola, BMW, Kimpton Hotels, Hilton, Wells Fargo Bank, IBM, Enterprise Rent-A-Car, Hewlett Packard, and hundreds of others. The Sales Bible is your personal, trusted, authoritative resource to reach your sales potential and shine like a star. Accept no substitutes. Here are a few highlights: * The 10.5 Commandments of Selling * Generate leads and close sales in any market environment * Find 25 proven ways to set hard-to-get appointments * Use top-down selling to fill your sales pipeline with prospects who are ready to buy now * Ask the right questions to make more sales in half the time * How to use the top social media platforms to create inbound leads and prove value The Sales Bible has helped tens of thousands of salespeople all over the world reach their potential and close the deal and it can help you. So what are you waiting for?